Blaston Show is preparing to celebrate its 60th Anniversary. As ever, it is set to be the perfect family day out, with plenty for all to enjoy. Over 100 dogs take part in the Dog Show each year. Catering for Kennel Club registered and Heinz 57 breeds, both working dogs and family pets can put their best paw forward. 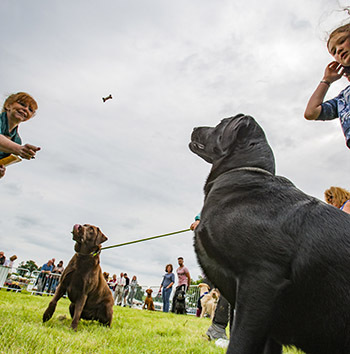 Competition is particularly fierce for the ‘Waggiest Tail’ and ‘Best Biscuit Catcher’ top prize, plus away from the show ring there is also some highly entertaining terrier racing. Native breeds of cattle, such as Hereford, South Devon and Lincoln Red will be on show, together with a selection of prime stock cattle. There is also a Sheep & Lamb Show with a vast array of classes including a Fleece Competition. Meanwhile, for equestrians Blaston Show offers everything from show jumping, showing and in-hand classes to the ever popular ‘Family Horse or Pony’. Last year over 20 children took part in the competitive Fancy Dress competition: a spectacular Air Ambulance perched atop the tiniest shetland pony and ‘piloted’ by two small girls set the standard. New for this year is a Heavy Horse in-hand class which is bound to draw the crowds. There are six Equifest qualifying spots up for grabs, and the show is a qualifier for The Showing Register Showing Finals. For the more mechanically minded, a Classic and Vintage Car Run concludes in a grand parade in the main arena. There is always something unusual to see such as Edwardian fire engines and 1940s lorries and Classic tractors also parade in the main ring. Throw in tug-of-war, bale rolling, hound parades and an anniversary pageant and it is sure to be an action packed day. The showground will be packed with over 50 trade stands and delicious food outlets, plus a zorb pool and junior crossbows to keep the children happy. Entries can be made online to all classes and advance tickets purchased via Blaston’s new website. Entrance to the Show costs £15 per car and gates open at 8am. A significant proportion of money raised on the day will be given to local charities, with Leicestershire & Rutland based charity Hope Against Cancer this year’s principal beneficiary.